The King family has long been criticized for insisting on payment for the use of their father’s name, image, speeches and virtually anything that they can claim for themselves or their foundation. 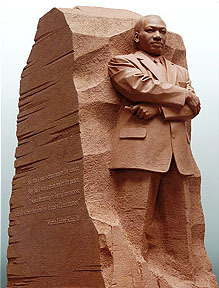 The family reached a new low this week when it was revealed that they had been paid more than $800,000 by the Martin Luther King Jr. National Memorial Project Foundation for the use of King’s image and words on the planned King memorial on Washington’s Mall. ….In the latest monumental shakedown, the King family’s Intellectual Properties Management Inc. was paid $761,160 by the nonprofit foundation raising money for the Washington memorial. This was on top of a “management” fee of $71,700 paid in 2003. The Kings have defended the payments by noting that donations to the foundation have been down because people were giving to the monument fund instead. The other possibility is that fewer people want to give to a foundation run by the King family. A speech can be copyrighted, but I didn’t realize that the image of a dead person — and an extremely public one at that — could be protected the same way. Live and learn.